While now a rarity, ski facilities at private schools were once a common feature. 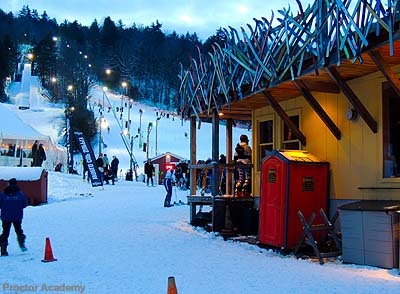 Lift served skiing at private schools has followed trend similar to that of public lift served ski areas in New England. In an era in which a rope and slope were adequate, many private schools, such as Deerfield Academy, Mount Hermon, and New Hampton, featured on-campus or near-campus facilities. As larger ski areas with advanced technology emerged, and as liability insurance became a significant factor, a majority of these school areas shut down. Many of the remaining school areas have modernized their operations by upgrading lifts, installing snowmaking, and purchasing groomers.